We do not mail paper tickets. Your confirmation email, either printed or on your smartphone, will let you pick up tickets at the box office. 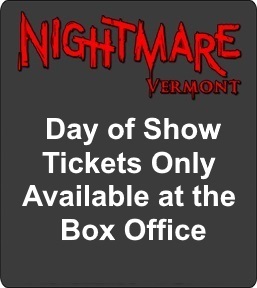 Spookyville Vermont: Anyone over the age of 1, will need to have their own ticket. Groups enter the event within 30 minutes of your ticket time. Please arrive 15 minutes before your ticket time. Nightmare Vermont: Groups of 20-25 at a time enter the event within 30 minutes of your ticket time. Please arrive at least 30 minutes early to ensure you do not miss your group. Parking, walking, and picking up tickets take time. All sales are final. There are no refunds or exchanges, even if you just miss your ticket time. Spookyville Vermont and Nightmare Vermont are drug and alcohol free events. Choose Your Show Date and Time! This is a complex, live show with special effects and an all-volunteer cast and crew. Due to unforeseen circumstances of bringing you this live experience, the event may run late. Nightmare and Spookyville are proud to support local artists and their work. Find props featured in the show and check out the rest of our evil genius' work at links coming soon.